Happy Fall! Hope this issue of 12 finds you wrapping up a lovely, restful summer filled with amazing, happy, sunny memories. While we were in Maine last month, my son and I added a new member to our family! 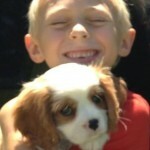 Meet Emmet (pictured on the right with my son Nathan)- our beautiful Cavalier King Charles Spaniel. Just to see him puts a smile on my face! I don’t know about you, but I am fall-obsessed! Sweaters, mums, hayrides, SBUX pumpkin spice lattes and cool fall nights bring me such refreshment! Nature always seems to bring us exactly what we need. For me, even though my summer was well-intentioned, it was also very challenging. Personally, I’ve had my plate full of some really difficult, distracting stuff. As if being an entrepreneur is not overwhelming enough, pile on “life” things and it’s easy to feel out of control. I am thankful that I have an amazing support system of family, friends, team and mentors around me. They provide peace, perspective and encouragement in times of unrest. As a natural goal-setter, it’s been particularly difficult for me to scale down my ambitions to maintain my own life balance. One of the things that I’ve learned in my own journey is to “just keep swimming.” If you’re familiar with the Disney movie, “Finding Nemo” you know all about the challenges Dory faces, yet she is relentlessly optimistic. Great coaching has taught me that even if you’re forced to move more slowly than you’d like; breathe, take smaller steps and just keep moving forward. Persistence will often help us succeed when all else fails.